A 20-member delegation from Toronto aboard UJA Federation of Greater Toronto's GA Mission to Israel recently had the opportunity to visit Jewish Toronto’s Partnership Region of Eilat/Eilot. During their visit, the Torontonians met with Dean Miri Amit and a number of students from the Ben Gurion University campus to gain greater understanding of the contribution that UJA federation has made towards creating this groundbreaking educational institution. The group also enjoyed an up close and informative session with members of the IDF’s Elite counter terrorism reserve unit. This meeting provided participants with the unique opportunity to gain a greater understanding of the threats in the region, to learn about their equipment and mode of operations, while also providing a unique perspective of how residents in Eilat take personal responsibility for the safety of all their community. 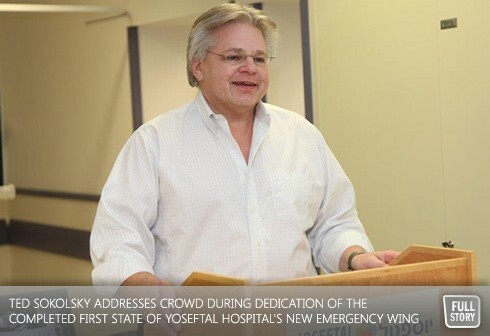 The Yoseftal hospital took advantage of the arrival of the delegation to dedicate the completed first stage of the new emergency medicine wing, the six-million project funded in partnership by UJA Federation of Greater Toronto, the Ministry of the Negev and Galilee and the Clalit health services. The cutting edge facility is a revelation in health care for all of residents, visitors and soldiers who serve in the region. “It was our privilege to share in the dream of a new hospital for Eilat, a dream made real through the wonderful vision and collaboration of our vital partnership,” said Sokolsky. The Toronto GA Mission delegation finished the day with an interactive meeting with children from the Diller Teen Fellowships followed by dinner with those behind Eilat's ongoing success in the field of renewable energy, including Udi Gat, the Chairman of the Eilot Regional Council since 1999, and the Eilat/Eilot Renewable Energy administration; Yossi Abramovitch (CNN green Prophet award winner), and young adults who are pioneers in the renewable energy project that was supported by UJA Federation of Greater Toronto.